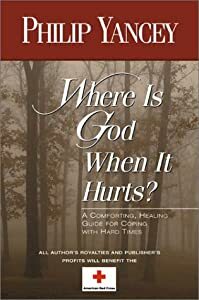 Cover of Where Is God When It Hurts? I wasn’t going to write about the New Zealand Earthquake, because quite honestly I didn’t think that I had anything to offer. There were plenty of things that I could write about this terrible tragedy, but should I use such a tragedy to get views on my website? It just didn’t seem quite right. So while I don’t want to address the earthquake itself, I want to look at a couple of pieces of scripture that come to mind. First from 1 Kings 19. Two thoughts relating to these passages. Firstly, the passage from 1 Kings. God was not in the great and powerful wind, nor the earthquake or the fire. After all of that came a gentle whisper – and the Lord was in the gentle whisper. When you think about what has happened in Oceania in the past few weeks, we have had floods, fire, cyclones and earthquakes. All disasters. All things that we wouldn’t wish on our enemies. But after all of these, what comes? Growth, renewal, revitalisation, rebuilding. Sometimes, you need to go through the pain to get to the point of growth. After the disasters, God is there. That is evidenced by the multitudes of Christians (and non-Christians, I must point out) making themselves available to help out. Whether that’s serving the emergency services workers food and drink when they’re working, or whether it’s donating proceeds of Op Shop sales, or holding retiring offerings as donations to relief funds, God is there in the recovery. As for the passage from Isaiah, God’s ways are different from ours. We can pray for things to change, and we should be encouraged to do so. However, we should not be disappointed when our prayers seemingly go unanswered. Our ways are not God’s ways. God’s ways are higher than our ways. As my officer put it, The deepest, most insightful, most brilliant of our thoughts is foolishness to the Lord, and the Lord’s most foolish thoughts are still far beyond our understanding. I believe that God’s heart would have broken over the lives lost in these recent disasters. Could he have stopped the earthquake? Absolutely. He is the one who created the world. However, as I share a thought from my dad, The Lord is the one who put this world in motion. He is the one who created the world. He created the laws of nature. If he was to come and stop an earthquake, or a flood, or a cyclone, he would be saying that the laws that he put in place we not perfect, as he is perfect. It would make everything that our world is based upon based on a lie. Whether this thought is how it works or not, I don’t know. And I’ll probably never know. However, it is through this thought that I can make peace with God when I get angry that prayers go unanswered. He knows what he’s doing. He has my life in his hands, and I will trust him completely. Though it may be painful, though it may be beyond comprehension, I will trust in him, and pray to him, and praise him whatever the outcome. Appreciate how you’re processing this Ben – no easy answers to the great questions of pain and suffering suddenly thrust upon many – but a strong handle on the stuff of faith and its resources.